Carting/Drafting is a highly involved sport. While many dogs can be hooked up to a cart and pull forward, we believe that handlers and dogs must be well-trained before practical use. Handlers must learn to correctly harness a dog, balance a load, and hitch a dog. Many dogs are not able to side-step or pivot the cart. 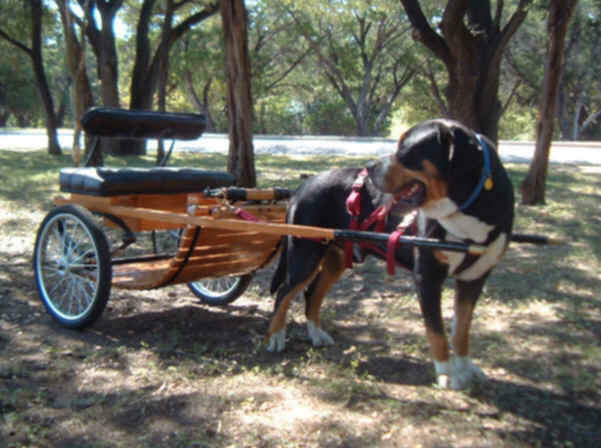 I have seen many times where incorrect hitching or loading of a cart can be harmful to a dog, even passing draft test. Please do your homework to avoid injury. Online Canine Drafting / Carting Guide here. All proceeds go towards funding working activities supported and sponsored by Roman Reign. *Training and working your dog in any activity carries inherent risk. Roman Reign is not liable for injuries that may occur while using RR equipment. It is the responsibility of the handler to ensure the safety of his/her dog at all times, and to practice safe working techniques. Roman Reign is always available for training consultations or safety guidelines. The handler assumes all responsibility for risks that may occur. Lightweight training shafts $25 each + shipping Sized to fit your dog. Used to get your dog accustomed to shafts. Training Carts for Small dogs and Big Dogs $190 for standard (fits dogs 20 -32 inches at shoulder) + shipping. Modifications extra. Milkcrate style or wooden base. Suitable for draft tests. Mouse decides to go through the course sans handler. Copyright ©2002-2013 Dr. Jennie Chen All images, content, and articles are copyrighted. Copying and pasting is called stealing.